Choose the right size ribbon-end finding for the width of your ribbon. 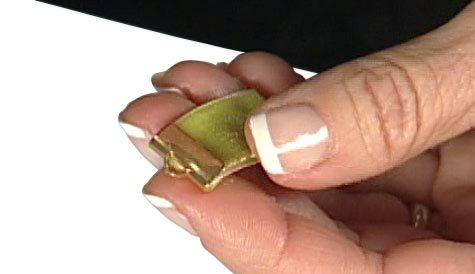 For example, a 13x6mm ribbon end will fit a 1/2 inch ribbon; a 6x5mm ribbon end will fit a 1/4 inch ribbon and so forth. You can always use a larger ribbon end for a narrower ribbon but not the other way around. Cut the ribbon slightly smaller than the total length of your necklace, the clasp will allow you to reach the desired length. Use nylon jaw pliers press the ribbon end closed part way, leaving enough of an opening so the ribbon will slip in. Apply a thin strip of the Ultimate! adhesive to both sides of the tip on one end of the ribbon. Insert the end of the ribbon into the ribbon end. Use nylon jaw pliers to press the sides of the ribbon end over the end of the ribbon, securing it in place.The pliers are slippery because of the plastic sliding against the metal, and you might need to work them around the surface of the ribbon end a bit--it's all worth it as the pliers don't mar the metal at all. Once the ribbon end is secure, repeat on the opposite end of the ribbon and set the ribbon aside. Allow the glue to dry according to manufacturer's instructions. Use Jumprings to attach the clasp of your choice.